DOCTORS have one of the most privileged jobs in the world - helping patients and improving the health of the nation. What doctors do is often wonderful, inspiring and life-affirming. They hold our health and sometimes our lives in their hands. They heal, comfort and are our friends when we are at a loss of what to do when ailments strike us or our loved ones. Doctors play multiple roles in our communities, as healers, as psychologists and also as friends. But why do some people think that the medical profession has lost its lustre of yesteryears. Part of the problem is that the medical profession often loses its attractiveness when compared to 9-to-5 office jobs with comparable or better salaries. The long hours, high stress levels, sleepless nights, missed meals and often, the deprivation of a social life, are part and parcel of a doctor's life. Being a doctor, which, at all its levels, used to be one of the few quick paths to upward mobility, has also suffered at the hands of the emergence of new fields in a technologically advancing world. However, when I was invited to give a keynote address at my Alma Mater, the old Medical University of SA (Medunsa), which has been relaunched and rebranded as Sefako Makgatho Health Sciences University (SMHSU), I was convinced that the medical profession was on an upward trajectory Our health systems and infrastructure are under a great deal of pressure. This is aggravated by our country's heavy burden of disease. Also, with only one out of six people able to afford medical aid membership, the health-care sector faces the daunting challenge of providing affordable, equitable quality health care for all its citizens. The recent World Health Organisation (WHO) survey of costs in health care globally showed that South Africa ranks relatively quite high in health-care costs. Added to high health-care costs, health-care facilities across our Rainbow Nation are facing a shortage of doctors, with hospital officials saying it's particularly challenging to recruit primary care physicians. The physician shortfall has forced some hospitals to reduce or eliminate certain services and to transfer patients to other facilities at times. This is a perennial problem. There are currently eight medical schools in the country that train about 1 600 doctors every year. However, despite the fact that both the public and private sectors are feeling the impact of shortages, the skewed distribution of human resources between the public and private sectors is enormous. SA has less than seven doctors for every 10 000 people. The WHO recommends a minimum of one doctor per 5 000 to 10 000 persons. According to research, over 70 percent of doctors, 75 percent of medical specialists and 40 percent of nurses are working in the private sector. Of the 34 324 doctors registered with the HPCSA, only 9 527 work in the public sector. Black doctors now outnumber white doctors in the public sector, with 4 103 black doctors to 3 542 white doctors. South Africa has less than seven doctors for every 10 000 people. The WHO recommends a minimum of one doctor per 5 000 to 10 000 persons. And with the majority of these doctors opting to work in urban centres, rural areas have been heavily reliant on foreign doctors. Health officials have tried to address health workers' reluctance to take up jobs in rural areas through incentives, while there has also been talk of increasing the number of medical graduates to help make up the shortfall. Personally, I believe that it is critical that a doctor dedicate a certain period of life towards the public health sector. The greatest need for the skills developed is in the public health sector and rural communities, and this is where doctors are exposed to medical situations that will develop experience and skills to the fullest. Bearing in mind the lack of resources within the public health-care sector, this should not be used as an excuse not to serve. So what is the solution to the shortage of doctors? The obvious one is to build more medical training facilities and get more teaching professionals so that we can accommodate as many as we can so that we can have more healers of our nation. Even that, if it is possible, is unlikely to meet the clamouring health-care demands. I have become the unofficial songbird, singing their praises to whomever wants to be a doctor. We do need more doctors. The only problem is that, as always, there is more demand than supply for seats in domestic medical schools. I believe that by getting more qualified and highly skilled medical professionals, like the ones who just graduated from SMHSU, we can start to overcome some of the health-care hurdles we face as a country. In my heart of hearts, I strongly believe that there should be a close relationship between medical professionals and the communities they serve. Hence the word "GP" should rather be "Community Doctor". Many of the challenges we experience today can be effectively managed if a strong partnership exists between the community, the state and the health-care professionals that strive to create a healthy population and equilibrium. There should be a sense of ownership from all angles and also taking responsibility collectively. The National Department of Health's National Health Insurance White Paper policy system represents an opportunity to make a profound break with the past and lay the foundations for a universal health-care system that will provide quality health care to all South Africans - not just those who can afford it. I firmly believe that as long as there is a collective will to overcome the formidable challenges that exist - it is achievable. I also believe that doctors should not shy away from seeking recognition. People in other lines of work do it, so why not doctors? My only hope is that they would also extend a helping hand to those without means. Doctors are at the very centre of our social fabric. They are the men and women on whom this society pins its hopes for sound health and peace of mind. There is and should be a lot of respect for the learned men or women who understand the mysteries of our ailments and help us in our time of pain. A doctor is presumed to be medically wise and all-knowing, someone to be looked for when we are at a loss on how to ease our pains. A doctor brings hope and benevolence. The Rainbow Nation needs more doctors. 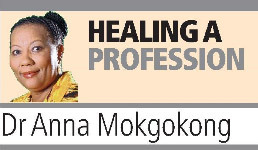 Dr Anna Mokgokong is chairperson of Afrocentric Health, owners of Medscheme and other health care providers. She recently launched the "Sefako Makgatho Health Sciences University/Afrocentric Health" Bursary For an Outstanding Female Student.